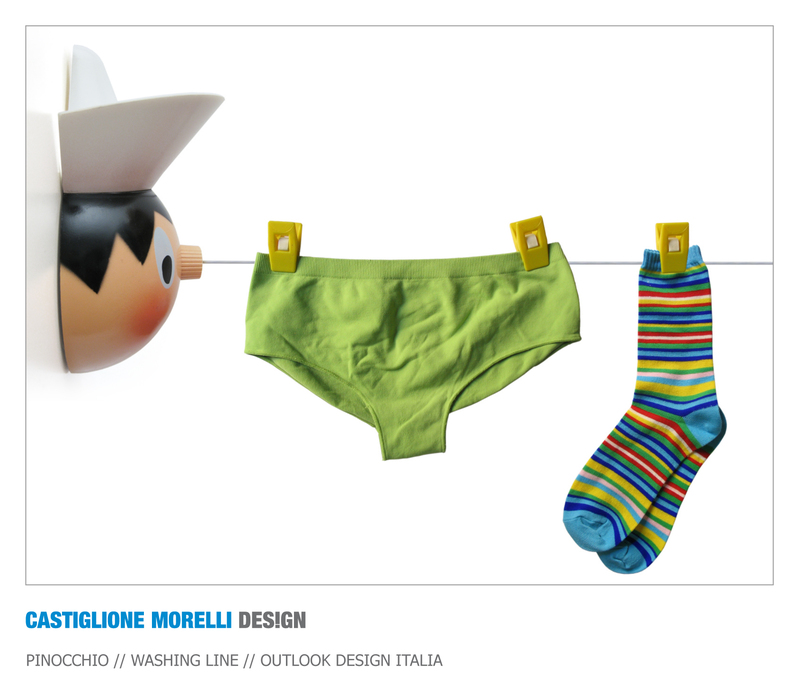 Just like the real Pinocchio, this washing line has an extendible string up to 2,5 meters. The painted plastic mask of the puppet contains a mechanism for the rewinding of the string. The washing line is fixed on the wall through expansion screws. When not in use the string is hidden inside the mask of the puppet. To use the washing line it's necessary to pull Pinocchio's nose and so unroll the nylon string. Afterwards you have to insert the end of Pinocchio's nose in the opposite wall bearing and turn at last the knurled ring nut to lock the string in tension. Now the washing line is ready to be used. Pinocchio's hat can contain the clothes pegs when there're no clothes to spread out.